Dinas Blog | Tegfan, Dinas Cross | A quiet holiday cottage in the Pembrokeshire National Park, near beaches and the coastal path. 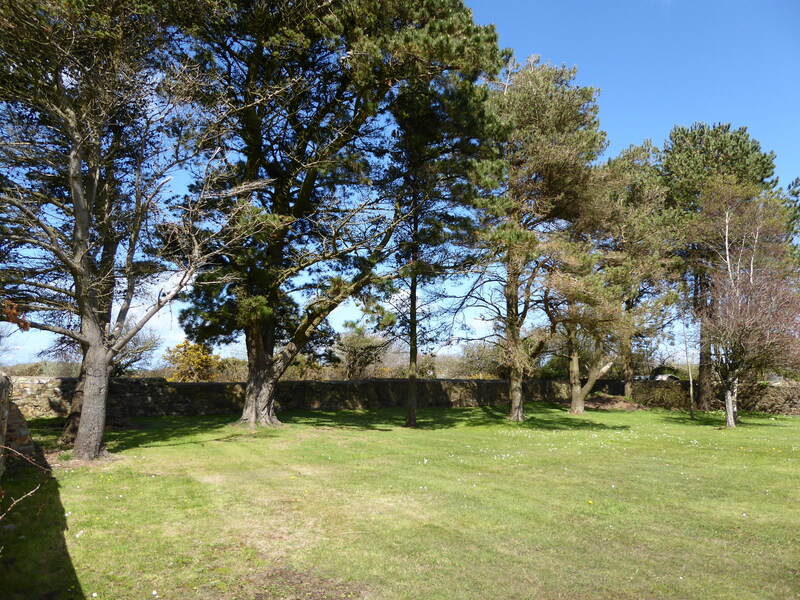 This little grove of Austrian or Corsican pines, planted in 1973, provides shade at the back of Dinas’ old school field, an area that had been the garden plot worked by the older pupils. The national campaign to ‘Plant a tree in ’73’, just as Dutch Elm Disease was beginning to destroy much of Britan’s woodland, was a great success. Trees and land were donated, Local Authorities, schools, youth organisations, business and local communities did their bit and the enthusiasm generated led to the foundation of The Tree Council in the following year. Len Urwin drew my attention to this hidden success story. We’re hoping that when ‘Bara Brith’ cafe gets even busier in the summer, some of us might be able to ‘take-away’ our tea and cake to sit out in the garden at the back. The trees will provide a welcome sunshade. Vicky Moller, local Plaid Cymru candidate, called this afternoon. She is standing for election to the National Assembly for Wales, on May 5th. She’s third on Plaid Cymru’s Mid and West regional list. Canvassing on the doorstep is a brilliant way to gauge the opinions of the electorate and the best way for voters to get to know the candidates. It’s quite rare, however, so “Well done, Vicky Moller”. The imminent disappearance of these power lines and their poles really took me by surprise. Click on the notice to read what’s planned. The delights of baby rabbits, lambs and spring flowers, however, were to be expected along the old meltwater channel between Pwllgwaelod and Cwm-yr-Eglwys. And they didn’t disappoint. 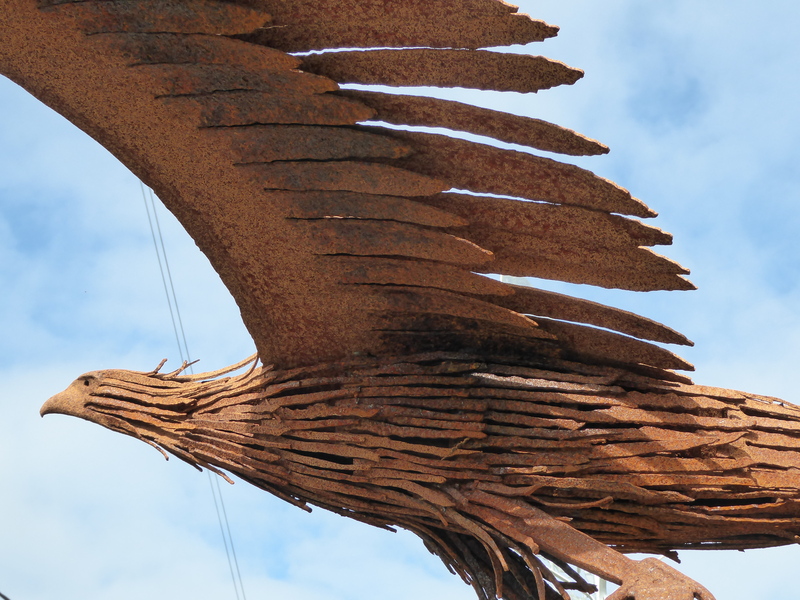 This bird can be seen outside the blacksmiths, J E Thomas, on Feidr Fawr in Dinas. The two red kites I failed to photograph were above the flat path between Pwllgwaelod and Cwmyreglwys. The beautiful birds didn’t seem in a hurry and turned our rather unexciting walk into a wonderful opportunity to observe their flying display. For brilliant photography of red kites and other local birds in the Pembrokeshire area, have a look at the blog of Lyndon Lomax. I’m so impressed! Aunt Emily earned her place among the sea captains of Dinas by having spent nine years at sea, mainly on the poop deck of the ‘Comliebank’. 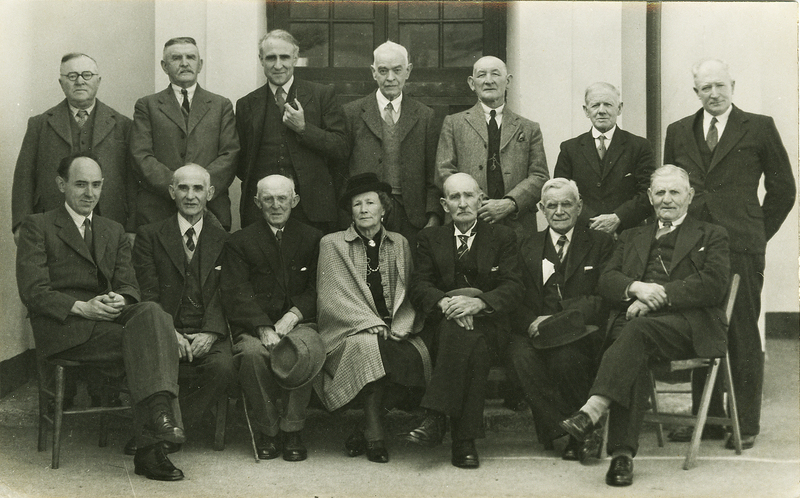 John Griffiths, her nephew, standing third from the left in the back row, coaxed her story from her, and in the telling of it for BBC Wales, his Aunt Emily became Aunt Emily to all. Emily Reynolds was brought up as the only girl in a family of 9 children on a farm in Dinas. Four of her brothers became sea captains and she got to know her future husband, Titus George when he came to help on the family farm between his sea-voyages. Dinas girls wouldn’t take a suitor seriously until he had at least a First Mate’s ticket so their courtship was by letter until the exams were passed. Emily and Titus were married by special licence in Liverpool when 1st Officer Titus George’s ship docked there in 1894. There were 4 people present for the ceremony, including Captain Harries of Dinas who was best man. They honeymooned in New Brighton for two weeks and then Titus went back to sea and Emily returned to help her mother on the farm. 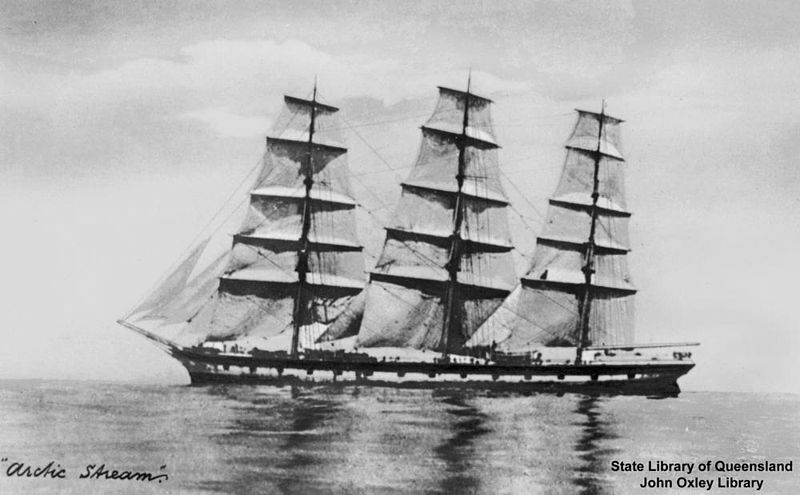 Titus passed more exams, captained his first ship, trading with Chile, and then, in 1903 was given command of ‘Comliebank’ a 4-masted barque that was scheduled to be at sea for two years before returning home. At this point Titus wrote to the owners saying that he’d give up command of the ship if his wife couldn’t come aboard. The owners were agreeable and Emily’s first big trip away from home was made possible with a first class ticket sent so that she could join her husband in British Columbia. She set off in September to cross the Atlantic at the time of the equinoxial gales, suffered sea sickness, marvelled at icebergs and then crossed Canada by train, across the prairies, through the Rockies until she reached Titus’ ship, loading timber in Vancouver. And she was truly impressed by her new husband’s skills as a captain. At that time of year the local farmers were offering large amounts of money to entice sailors away to help with the harvest. Some ships were delayed for weeks without a crew – but Titus lost no-one and his ship sailed away as planned. Her time at sea was spent on the poop deck, quilting, sewing, woodcarving and rug-making. If it was too hot or wet for comfort she sat under awnings for protection. She’d watch shark fishing and when albatrosses were killed – and it was hard work killing them – the steward would give Emily their white breasts so that she could have them made up into the muffs that were fashionable at the time. Whatever the weather, she relished the experiences and was up on deck to see what was to be seen and making sure she knew what decisions were being made as to the sailing of the ship. She sailed to Australia five times altogether. On her second trip they arrived at night in the Spencer Gulf and docked at the tiny Port Germein. The ‘Comliebank’ was too long to lay alongside the quay but Emily was greeted by a band to welcome the first lady ever to arrive in that port by ship. She got to know the large Welsh community in Sydney and attended their Welsh chapel on Sundays, travelling by train if the ship was docked at Newcastle. There were other occasions to socialise – they rarely carried passengers but sometimes stayed for long periods at anchorage in the same area. Valparaiso, before the opening of the Panama canal in 1914, was a favoured stopping-off point for ships rounding South America and at times there would be 50 ships in the harbour. The captains and their wives would socialise and enjoy visits ashore to a thriving town with a large European immigrant population. The weather and the scenery, however, formed her abiding memories: her first sight of the Andies, her terrifying encounters with icebergs when the lifeboats were made ready and the crew prepared to abandon ship, the Comliebank’s failure to get through the Straits of Le Maire (Tierra del Fuego) with the wind dead against and their miraculous escape by backing out stern-first. She remembered the ship catching fire, fighting gales when the sails broke loose, hanging onto life-lines fixed from the poop to the fo’c’s’le and, nearing home, fourteen days fighting a blizzard in the bay of Biscay with two members of the crew lashed to the wheel. In 1914 the company switched from sail to steam and Emily never went to sea again. 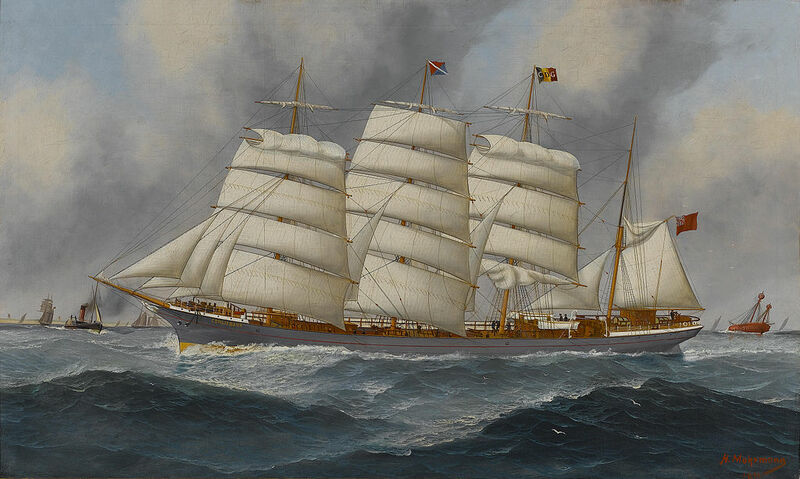 The ‘Comliebanks’ was sold to a Norwegian company and was the first sailing ship to pass through the Panama canal. She changed name and was later torpedoed. The Company awarded Emily an inkwell in recognition of her years of service. It was made from the rudder of Captain Scott’s ship ‘Discovery’ and the only other example to be made was given to HM George V.
Titus retired when he was nearly 50, in 1918. Emily’s programme was made in 1953. Dinas Historical Society re-enacted the programme and my information comes from a CD of that splendidly successful event. Look on the pavement just to the left of Dinas’ petrol station and you’ll find this black, water-proof box. Open it up and you’ll find egg boxes, free-range eggs and a money box so that you can make your purchase. 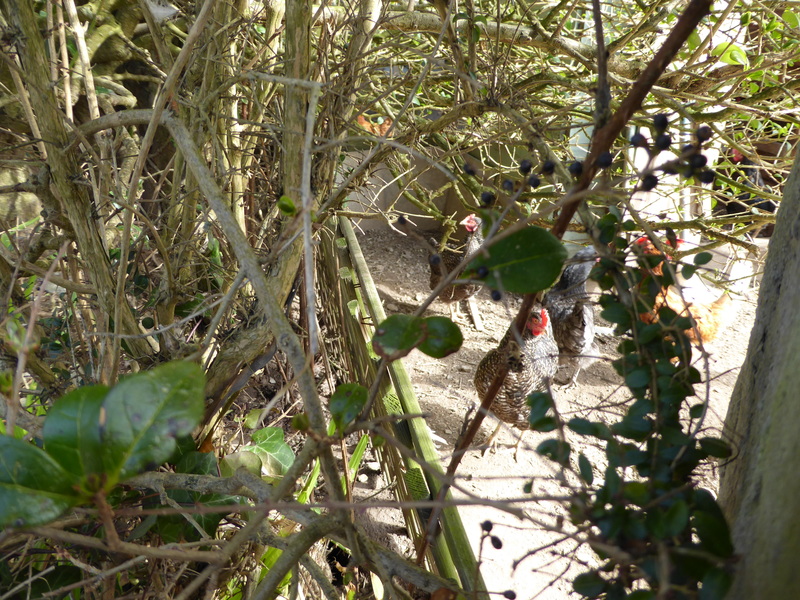 ‘Free-range’ can be a bit of a weasel term but you only have to peer through the hedge to assure yourself that these hens can indeed freely range. The Frenchman Motel*, Goodwick, that hosted bands such as Status Quo, The Tremeloes, The Trogs, Sassafras and Elvis Costello in the 1970s has long gone. Did these feet bop along with the fans that were drawn to the events in their hundreds, kept upright by the crush in a venue presumably officially limited to many fewer? 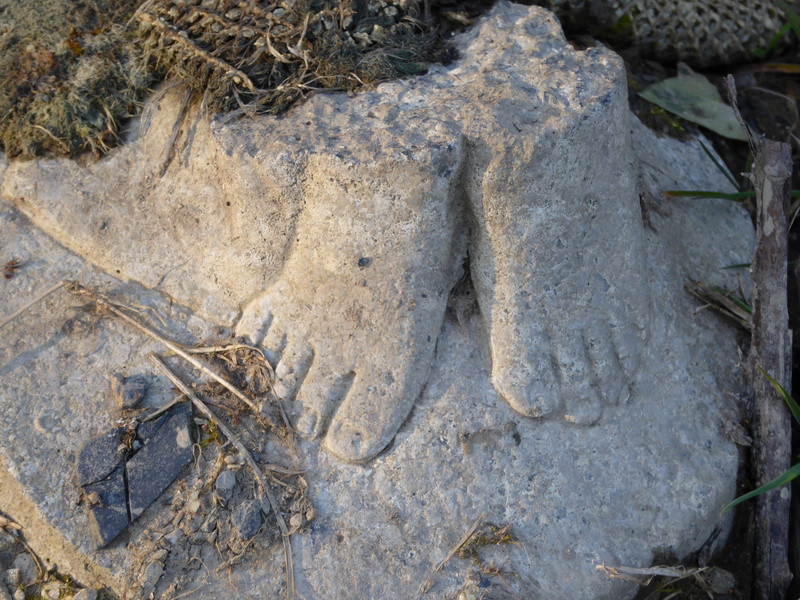 Does anyone recognise these feet? They rest by the piles of masonry and loose bricks that were once ‘The Frenchman’. The rubble was initially heaped high enough to provide an exciting playground for neighbouring children but it’s now reduced to hummocks and dips that will soon disappear under a spongey layer of grass and moss. *The Motel was above Wern Road and the railway. Click here for a postcard reminder.